A pace band is a great way to ensure you hit your target time. All you do is type in your hoped-for time and the pace band will be created, showing how long it should take to reach each km marker along the race route. You just print it off, cut it out and sellotape around your wrist. As you reach a km marker, glance at your wrist and see if you are ahead or behind schedule. If you are behind, you need to run a bit faster to reach the next km marker. If you are ahead, you can either ease off so that you don’t run out of steam later on, or better yet, aim for a faster time than you originally planned. Some runners choose to wear two pace bands: one for a realistic target and one for their ideal target if things are going well. That enables them to judge how the race is going – much easier than just running and hoping for the best. Here’s a link to the pace band I use. Have fun creating your ideal race time! With a month to go before the Bristol 10K, I’m stepping up my focus in different ways. It’s interesting where I find inspiration. 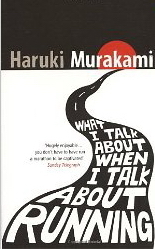 Recently it has been talking to other (mum) runners about their experiences and reading What I talk about when I talk about running by Haruki Murakami. I’d not heard of this book until I was given it for my birthday – what a clever gift! “No matter how mundane some actions might appear, keep at it long enough and it becomes a contemplative, even meditative act”. “…the point being, to let the exhilaration I feel at the end of each run carry over to the next day. “I run in order to acquire a void”. Talking to another mum about running this week, we agreed that when parenting gets intense, the ability to run can help. Sometimes, when I’m feeling anxious about something, I crave the momentum of running. The beat, the pounding, the quest for a rhythm of breathing, the movement away and back again, all help my mind to relax and, often subconsciously, work the problem through. I come back mentally refreshed, ready to try again. It was interesting to hear these thoughts expressed by HM. Also, that he often does not want to start running each day. I don’t run each day, but when I’ve set aside a time to run, I do wake up thinking “I really don’t want to do this”. At 1 minute 40 I always want to stop. But once I’ve found my momentum – and this happens at different times – the therapy starts. HM writes about training for various marathons, an ultra marathon and triathlons. He describes running the first marathon in Greece. He talks about the change and structure running has brought to his life and how is has helped his work as a novelist. Having not until recently been a “runner” – and scoffed at the idea of being so – I never thought I’d find myself reading, enjoying or relating to a book like this. I recommend it as a gentle reflection on the power of running. I’m also reminded what a wonderful gift a book can be; the discoveries you can make through reading something you would have not necessarily picked yourself.